Though it takes a bit of time and patience, making an iguana costume is well worth it. It is a creative choice that will stand out since it is usually an animal that people overlook. 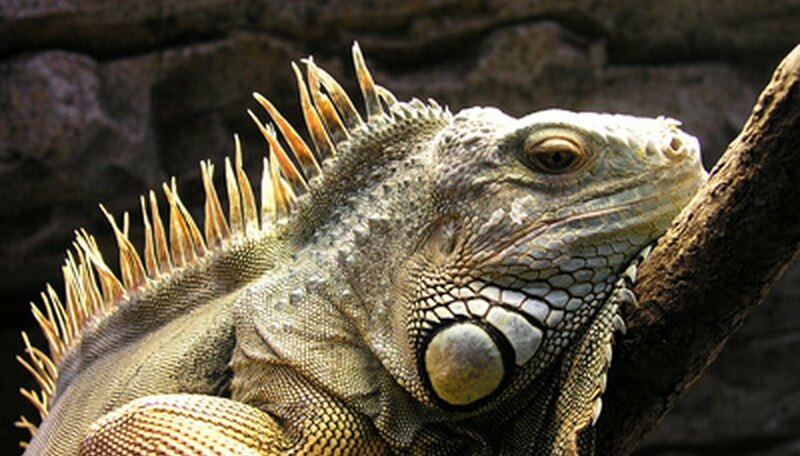 Iguanas have a distinct look and are often multiple colors so feel free to change the colors mentioned here to suit your preferences. Make your iguana's spikes by cutting out yellow triangles from the felt. Ideally they should be different sizes, starting with the largest and getting progressively smaller. Cut out enough to line the top of the hooded sweatshirt to the bottom. Sew the spikes on starting at the center of the top of the hood and working your way down the center of the sweatshirt until you get to the bottom. Cut off a leg of one of the pants. This will be the tail of your iguana. Cut off part of the bottom so the tail won't drag on the ground. Cut the edge of the pant leg to form a point. Sew it closed. Fill it with the stuffing. Sew the top closed. Attach the tail to the back of the pants by either sewing or using the fabric glue. Cut out circular patches from the rest of the yellow felt and also from the light green felt. These will be the scales of your iguana. Glue these to the front of your sweatshirt in any pattern you desire. If you want, add more scales to the top of your hood or back of your sweatshirt as well. You can even add scales to the tail. If you can find fabric that matches the pants and shirt you can use that to make the tail. If you have extra yellow felt, cut out small spikes to attach to the tail. Wear green gloves for an additional touch. To add more texture to your costume, cut small circles from some sandpaper. Glue them on top of some of the patches.